We have covered mother loss for many ages. Please go back and refresh yourself with the previous blogs. Let’s move forward to the 40’s. What is a 40’s woman’s life like? This is middle adulthood. During middle adulthood, we establish our careers, settle down within a relationship, begin our own families and develop a sense of being a part of the bigger picture. We give back to society through raising our children, being productive at work, and becoming involved in community activities and organizations. The 40’s woman’s challenges are much like the 30’s, but accelerated. Everything is magnified. The demands on her work, home, career and family s-u-c-k every ounce of energy from her. She usually has put others ahead of her needs. She has spent so much of her waking hours on these demands she has hardly had time to create true relationships. Her mother relationship may be the only one she has had time for. This may be the first time the 40’s woman looks at her mother and sees her as a friend or a peer. When a 40’s woman experiences mother loss, the demands on her life leave her no time to grieve. When she loses her mother she feels alone. Although, she may feel very alone, she must be the rock for those around her. There is no one there to support her. So she stuffs her feelings only to have them come back to haunt her later. 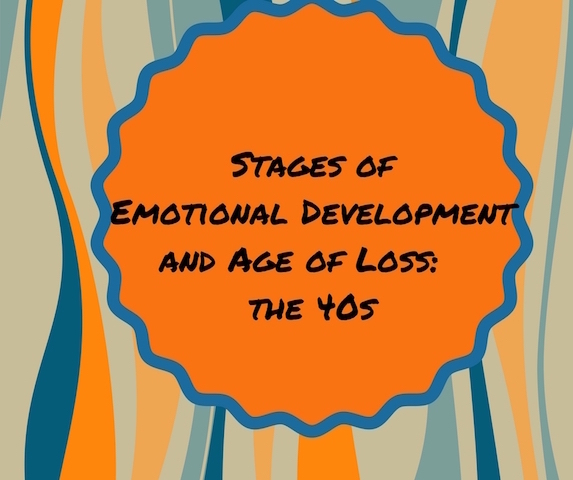 Psychologists tell us this is the most common decade to experience loss. Most women will lose their mother in the 40’s. Compounding the grief from mother loss are those darn hormones! The 40’s woman begins to experience the erratic emotional swings and hormone imbalance that occur during peri-menopause. Menopause is not only the physical changes in our bodies but it is also a time of deep internal reflection. What we have not “dealt” with (grieved) we get to do again but with a vengeance. There is an old saying about grief, “Pay now or pay later.” You don’t just get over it, you must go through it. That is the only way. Grieving the loss is important to manage this stage. Don’t stuff it. Pay attention to what you need and go out and find it. The Motherless Daughters Ministry is here to support you. — You are not alone. Oh Jennifer, it sounds like you are right there in the spot where you absolutely need other women in your life. From what you have said, you have always been the strong center for everyone. The problem is when we parent, it is not always reciprocal in the support that we get back. Your boys do not have the experience to know how to support you and they are at the point in their life where they are figuring out what they want to be. And your husband may not know how to do this either. You need other women who can be a safe place for you. Where are you located? We are in the Cincinnati, OH area and offer many groups that are face-to-face. In 2018, we will begin online community groups and classes. Would that might be of interest to you? Just email me and let me know how we can best serve you. My mom went to be with Jesus December 29, 2017. She had a heart attack in front of me. She was truly my best friend, my prayer warrior. I am really having a hard time. I know about death and I am thankful she is not here, for her sake, but I am hurting so bad. It comes in waves and I will cry, then be ok, have joy and even laugh usually, but this one started Friday, Jan. 26, 2018 and it is now Sunday the 28th. I am still a mess. I am asking for prayer. Thank you for this. Prayers certainly. Know you are normal. That is what grief does, it comes in waves. When it hits you like it has, just stay with it. Don’t ignore it. It will just get bigger. You also have the grief that goes along with sudden loss. It is a double whammy. Sudden loss also leaves you grieving in bits and pieces. You will be OK then wham, you are not OK. You did not have time to begin the process of grieving. You absolutely need a support system. Don’t know what resources you have but know you can always turn to us. Get connected. You are not alone.